Collection & drop off from Oliver Tambo Int Airport (JNB) or any hotel in Jo'burg. FGASA & DEAT registered professional 'Safari Ranger' guide. Roof top tent accommodation inc sleeping bag. Expedition equipped Land Rover Defender. Land Rover 'all day' game viewing drives. One 'open vehicle' night game drive. 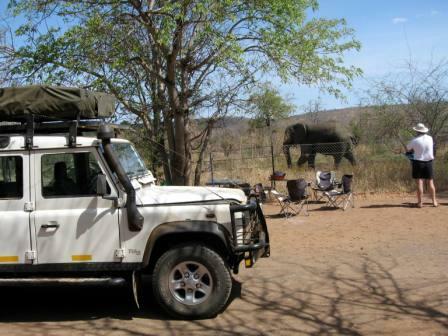 Our Expedition Safaris are carried out with a 'Safari Ranger' guide and not with just a tour guide or a driver guide. Interested in a Kruger Park Expedition Safari, email us right now - we'll check availability and reply with a safari offer in 48 hours. A) Type of safari - Kruger Park Expedition Safari. B) Number of days - 3 day, 4 day, 5 day, 6 day and 7 day. C) Number of people - minimum 2 people guarantees departure. D) Collection & drop off requirements - your hotel or flight details can be provide after we have confirmed safari availability. All prices are in South Africa Rand (ZAR). VAT is included. Our Kruger Park Expedition Safaris cater for couples, families and big private groups, with a maximum of four people per Land Rover. Trips required to depart with only two or three people, our prices are structured for one vehicle being utilised for the trip, which will be the guides vehicle. Although the Land Rover Defender is an icon throughout Africa, Safari Rangers is in a position to carry out our Expedition Safaris, utilising other suitable 4x4 vehicles: Discovery 3, Toyota Land Cruiser & Hi-lux Double Cab including the Nissan Hard-body. Children under twelve (12) are charged half price. We include a door-to-door collection and drop off service at your hotel or from the airport. All safaris are conducted in English. We do not charge extra for any special meal requirements for vegetarians and diabetics. Best 'Value for Money' in South Africa for sure!